I met Sylvia Weiss Sinclair at the 2018, Alabama Writers Conclave in Orange Beach. 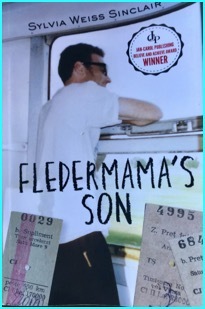 When she mention that her novel, Fledermama’s Son, was inspired by her interest in delving into her family history, I immediately sensed a connection between us. Fledermama’s Son chronicles the journey of a mother and her troubled son in search of their ancestral roots in Romania. The train trip through Post-Communist Romania and the people who befriend them turns out to be most enjoyable. The discovery of their family’s connection to the tragedy of the Holocaust resonates deeply in her son’s soul, and strengthens his identity. 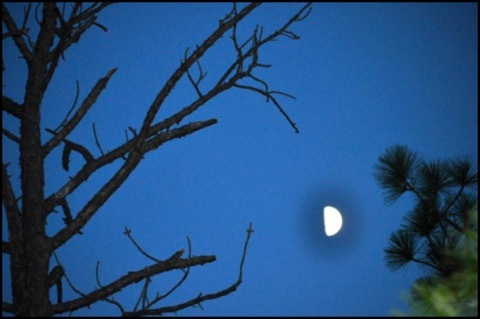 When I shared my novel, The Nine Inheritors with Sylvia, she too, felt the connection, and wanted to read my novel. 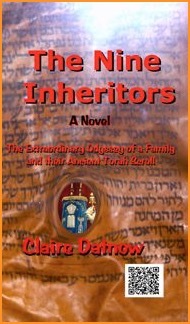 The Nine Inheritors: The Extraordinary Odyssey of a Family and Their Ancient Torah Scroll. Sylvia writes: Claire Datnow is a master storyteller who brings the characters to life as she reveals the ancient culture and customs that shaped the lives of the Jewish people. The book sheds light on my own personal history, which I explore in my own book, Fledermama’s Son. My father was Jewish from a wealthy family in Hungary, who came to America in 1922 with his older brother. He was ten years old, too young for a Bar Mitzvah and never had one. In 1940, he fell in love with my mother, a Protestant and married her, like one of the characters in The Nine Inheritors. He too, was shunned by his Jewish family. During World War II people were against the Jews and my mother told me not to talk about being part Jewish. The only member of my father’s family I knew was my father’s mother, my Granny. I remember my father inviting her to dinner for birthdays and Christmas. She never spoke much to me, only to my dad in the Hungarian language, so I never knew much about Jewish traditions and their customs. Reading Claire Datnow’s book has helped me to understand the hidden history of my own family. There are many extraordinary novels written about the Holocaust. These two books highlight how that tragedy continues to impact on lives of those who survived, and will continue to impact on generations to come.